By popular demand our +10% bonus Item Mall Points event, when you transfer WP Energy to your favorite game account, has been extended through 6pm Tuesday September 4th! Be sure to stock up on points for your favorite game items, and have a fun Labor day weekend! VIP+ Promotion For a limited time, (August 9th-September 3rd) we'll be offering a very special VIP+ package which will include a VIP subsciption along with Points for your favorite title for one low price! This deal will be limited to once per account during the event period! Also don't forget you have to purchase these packages with WarpPortal points! 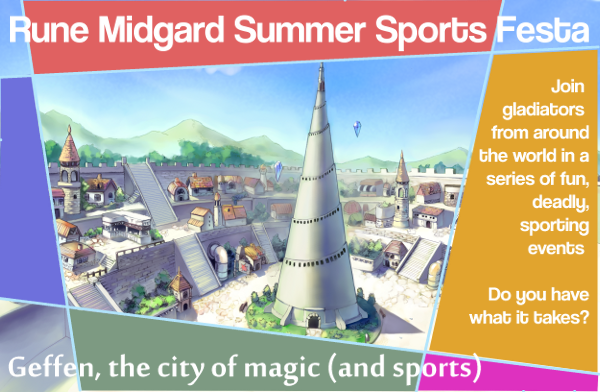 The Rune Midgard Summer Sports Festa Launches! Geffen, Rune Midgards-Let the games begin! The multi-part summer sports festival in Geffen kicks off this August, citizens from around Rune Midgard can join a national team and prove their mettle in a series of sporting events. Terra Track and Franklin Field in western Geffen are the representatives of the Summer Sports Festa, last in a long line of sporting events dating back to ancient times. They are looking for some help in recruiting more countries into sending teams to compete at the games. Kunlun Launches on Classic and Summoning Fun on Renewal! A bevvy of fixes and new features being added tonight! Exchanger added for the Hawt Groove pack to allow for trading in items from that pack for battle manual X3s. Kunlun Ferry has been repaired! 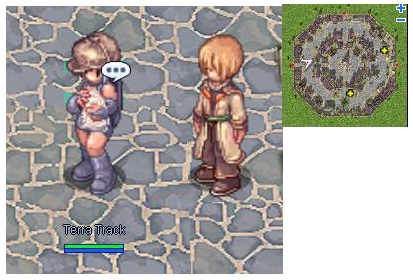 Those that use the Magic Stone, can get a special +200% exp for 30 minutes (1 time) by talking again to the "Magical Stone Checker", you will get the option to use it now or not after will offer you options to go to a dungeon (1 time). MVPs will no longer Earthquake, this will stay that way until Trans update, so go get Bapho! Dungeon Teleport scrolls 10 box for 75pt. Rental Gears implemented. Lower powered shield, shoes, garment options. These are intended to be permanent. For a comprehensive list of fixes and changes to Classic: Loki, please check out this thread. It is wonderful to see so many old and new faces joining us on the Classic Server for its Launch Weekend! Certainly we have exciting times ahead as the Classic server cuts its own future path with our players help. We have a few events and opportunities that we want our citizens to know about so they can take advantage of it to create their best Future possible. VIP and Job changes: The Classic server doesn't have an in-game VIP system right now, if it did you'd be able to job change without the "Magical Stone". We don't want our VIP players to be too concerned about the Magical Stone Purchases, so if your account purchases, and uses a Magic Stone to job change, we will refund the 100 Kafra Points to that account as Kafra points. The first time we will do this giving back will be July 12 (Thursday). So be sure to have VIP and use your own Magic Stone to be eligible. No server launch would be complete without a leveling challenge! We are having a race to 99/50 2nd class. Every character that reaches 99/50 will be 1 entry into a drawing. 10 winners will be chosen to get $100 from the pool of eligible characters. This contest goes until July 31st. As an added benefit, any character that gets to 99/70 as their Transcendent class (once implemented) we will copy that character over with stats/skills reset, and with appropriate Eden gear to Ymir. So you can play on both servers if you wish! We are going to be updating frequently, both to add more content, fix any bugs and in general to improve your playtime fun! For details on what changes are coming. Ragnarok Anniversary Event Week Extravaganza! We're blowing the doors off of the "cool stuff warehouse" with this Anniversary Lucky Box! In celebration of iRO's 9th Anniversary we wanted to celebrate a bit and introduce the community to some great, never-before-seen-on-this-server headgears and other useful items in our new Lucky Box! Also to celebrate, Anniversary Quest is updated to part II! And both the GoCash and Ultimate Game Card are having promotions when you use them to buy WPE! Available from June 13 - July 3rd. See the Anniversary Extravaganza Box on the iRO Website!